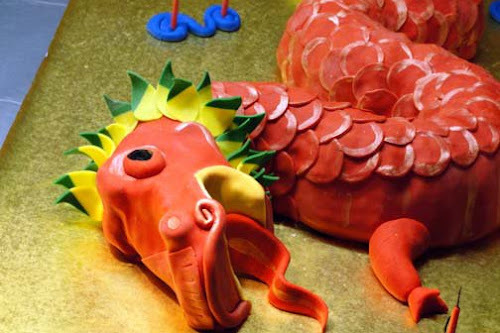 When I last spoke to my sister's childhood friend, Sheila told me, "You are going to make a cake for me!". Sure enough. 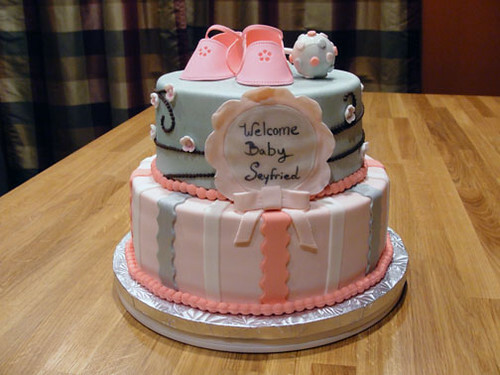 A few months later, I received a message from her explaining that she wanted a cake for her baby shower, and that her sisters would be contacting me shortly. I couldn't wait to see what they had in mind for her, especially after knowing her for so long. The theme was based around cherry blossoms, and the colors are pink, white, silver, and accents of brown. With so many samples of cherry blossom cakes, it is a challenge to design one that looked like a baby shower and not a wedding cake. I began with one sketch and sent it over, but the design didn't really scream to them, I told you this was going to be hard. The final design was pretty much a 360 from the original idea, but still keeping the cherry blossoms. Two cake flavors made up the cake: red velvet with cream cheese on the bottom, and classic vanilla and vanilla on the top. The 10" bottom received a blanket of pale pink, and was accented with wavy fondant ribbons of a brighter pink and shimmery silver. Straight strips of white fondant broke up the spaces in between. The 8" top layer ( where most of work happened ) was first covered in a light gray fondant, and then was airbrushed with a silver sheen. The two layers were then stacked before I continued. 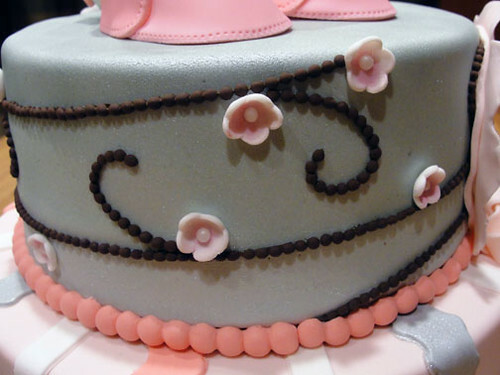 Small beads of chocolate fondant were attached to the top layer in flowing swirls around the cake, creating these delicate and whimsical branches. Small cherry blossoms were cut out of white fondant, and cupped on a thick foam for shape. I brushed the center of each one with some pink petal dust for a natural and subtle color, and accented with an edible candy pearl. For the message plate, I created a soft, hand-stitched ribbon out of layers of pink and white fondant. The message is written in a edible color marker! 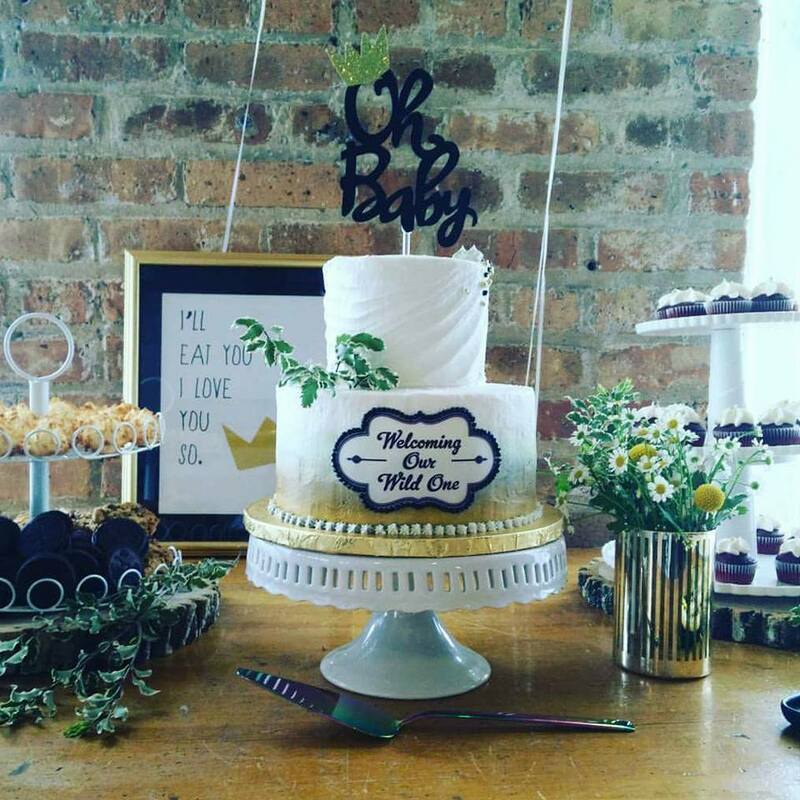 My favorite part of creating this cake was definitely the toppers. I created some paper templates for the three parts of the booties, and cut out the sole, toe, and heel. These were attached to each other with a bit of gum glue, then gently filled with tissue to hold its shape until dried. Do you see the eyelets? I punched those out using a #2 icing tip. They added so much character to the cute booties. The rattle, which I designated to be eaten by the mommy-to-be, was actually two cake balls on a lollipop stick. I crumbled up some cake with a bit of frosting, and rolled the mixture into two perfect balls. I allowed these to set in the fridge for a bit before attaching them to the stick. I gave each end a good dip in one smooth motion, and tapped off the excess candy coating. 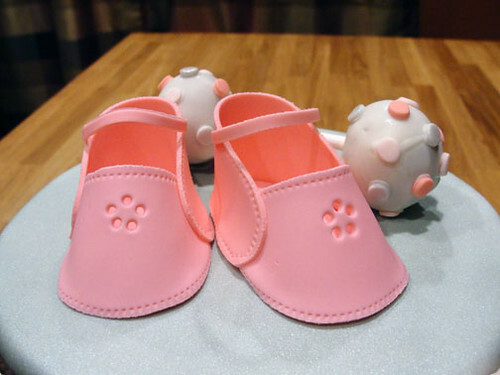 Using a #5 tip, I cut out little dots of different color fondant and attached them to the rattle. I couldn't be any happier with the results. Congrats again to Sheila!